The history of Wright-Patterson AFB literally began with the origins of manned, powered, controlled flight. 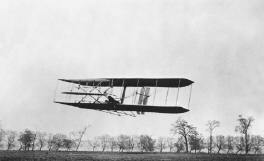 Following their successful proof-of-concept flights at Kitty Hawk, North Carolina, in December 1903, Wilbur and Orville Wright selected an 84-acre plot of land near their home in Dayton, Ohio, to serve as their experimental flying field, as they sought to transform their invention into a practical flying machine. Here at the Huffman Prairie Flying Field in 1904 and 1905 they developed the first practical airplane (the 1905 Flyer) and, as Orville noted, �really learned to fly.� Over this prairie, now a part of Wright-Patterson AFB, the brothers performed the first turn and circle in an airplane and solved the final mysteries of flight. Here, too, they invented and used the first successful aircraft catapult launcher. The brothers returned to the Huffman Prairie Flying Field in 1910. This time the field served as home to the Wright Company School of Aviation, the Wright�s flight exhibition company, and a test range for their aircraft company. Among the graduates were Army Lieutenant Henry �Hap� Arnold, who was sent to the school in 1911 to earn his wings, and A. Roy Brown, the Canadian Ace who received the aerial credit for downing Baron von Richthofen, the Red Baron. The Wright brothers operations on the Huffman Prairie ended in 1916 when the aviation school closed its doors. During these years, the Wrights had used the Huffman Prairie as a research and development facility, flight test center, logistics depot, and training field. These functions became precedents for operations around the Huffman Prairie site for the rest of the century. Even more important, the �can-do� spirit that Wilbur and Orville brought to the flying field would inspire their heirs to push aeronautical engineering to its technological limits. When the United States declared war on Germany in 1917, the War Department began a rapid expansion of its military facilities and purchased McCook Field, Wilbur Wright Field, and the Fairfield Aviation General Supply Depot. It was named McCook Field and opened on December 4, 1917. This 254-acre leased complex was located just north of downtown Dayton. It became a temporary home for the Airplane Engineering Division of the U.S. Army Signal Corps until Langley Field in Virginia could be completed, but by the end of World War I, 2,300 scientists, engineers, technicians, and support officers were working in McCook�s 19 sections and 75 branches. In the postwar period, this force would dwindle to an average of 50 officers and 1,100 to 1,500 civilians. McCook Field�s achievements proved so substantial that in May 1919 all experimental aircraft activities being handled at Langley Field were transferred to McCook. The Air Service Engineering School at the field evolved into the Air Force Institute of Technology. Among the Engineering School�s first graduates in the Class of 1920 was Lieutenant Edwin E. Aldrin who also served as the school�s operations officer and whose son, Major Edwin �Buzz� Aldrin, would walk on the moon 49 years later. 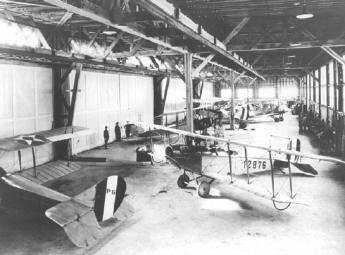 Curtiss JN-4D Jennys in McCook Field main hangar, 1918. Construction of the Fairfield Aviation General Supply Depot* began in the fall of 1917 on forty acres of land immediately adjacent to Wilbur Wright Field that the Army purchased from the Miami Conservancy District. The depot�s mission was to provide logistics support to Wilbur Wright Field and the three other Signal Corps Aviation Schools. Rapid demobilization and restructuring followed the conclusion of the Great War. On January 10, 1919, Wilbur Wright Field merged administratively with the Air Service Armorer�s School and the Fairfield Depot to form the Wilbur Wright Air Service Depot. Throughout the years, the depot underwent numerous name and organization changes, but was commonly referred to as the Fairfield Air Depot (FAD). In 1921 the depot became the home of the Property, Maintenance and Cost Compilation Section, the earliest antecedent of the logistics component of today�s Air Force Materiel Command. McCook Field had been built as a temporary experimental wartime testing site and its shortcomings soon became evident. The field�s short runways and obstructed approaches challenged pilots. Rapid advances in aeronautical technology were producing larger, more powerful aircraft that overwhelmed the field. It was becoming unsafe for both aircrews and the local population. Its temporary buildings were expensive to maintain and the field was hampered by the absence of a railroad line. Finally, the rent for these inadequate facilities was extremely high and landowners wanted to convert the land to more profitable uses. These factors sent the War Department in search of a new, permanent site for the Engineering Division. When Dayton�s businessmen and citizens learned that they might lose the engineering center, they seized the initiative. 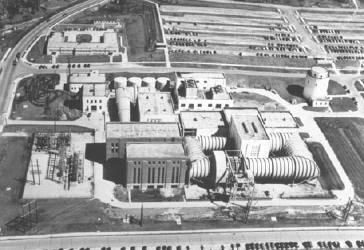 The Engineering Division gave the community a stable and expanding economic base. It was also a great source of pride for the city that considered itself the birthplace of aviation. Furthermore, Dayton�s industries directly benefited from the technology developed at McCook and the skilled workforce that the Engineering Division attracted. 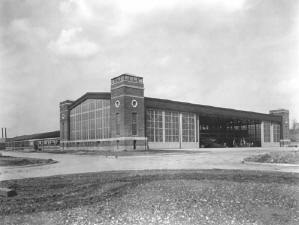 Under the leadership of the Patterson family (founders of the National Cash Register Company), the city�s prominent citizens formed the Dayton Air Service Committee to save the facility. The Committee soon reached an agreement with the War Department to build a permanent engineering facility in Dayton provided the land was donated to the federal government. It then organized a 48-hour fundraising campaign that garnered $425,000 of private money to buy the land and fund a monument to the Wright brothers. In 1924, the Dayton Air Service Committee purchased 4,520.47 acres of land northeast of Dayton and presented the deeds to President Calvin Coolidge. The land donation included the previously leased site of Wilbur Wright Field. The War Department combined this gift with its adjacent site at the Fairfield Air Depot and redesignated the entire acreage as Wright Field to honor both Wilbur and Orville Wright. The transfer of equipment and operations from McCook Field to Wright Field begun in March 1927 was essentially completed by June, although the last of the equipment was not moved until May 1929. The formal dedication of Wright Field was held on October 12, 1927 with Orville Wright raising the first flag over the new engineering center. The dedication established three precedents. It was the first time that an Army installation was named for two civilians who had never been in military service. It was the first time an installation was named for a living individual. And, in all likelihood, it was the first time that an individual so honored by the military service was present at his own memorialization. As the nation�s foremost aeronautical engineering center, Wright Field became involved in every aspect of aircraft design and production. During the 1930s, the engineering trend at the field was toward diversification, expansion, and modernization of aircraft design. Engineers and scientists worked to improve aircraft structure and aerodynamics. They developed a wide range of experimental and production aircraft categorized by mission: attack, pursuit, transport, bombardment, observation, photographic, training, and rotary wing. Each innovation served as a stepping stone to the next. Thus, the Boeing B?9 and Martin B?10 bombers paved the way for the B?17 and became progenitors of the B?29 as Wright Field engineers tried to develop a true long-range bombardment aircraft. Wright Field was also instrumental in marketing aircraft to foreign nations. The work performed in the 1930s would soon provide America with a decisive edge. The aircraft that won World War II were either in development or production when the conflict began. Although the entire installation had been named �Wright Field� in 1924, there was considerable community support to formally recognize the Patterson family�s leadership in keeping the Engineering Division in Dayton. This recognition occurred on July 1, 1931 when the War Department redesignated that portion of Wright Field east of Huffman Dam as �Patterson Field.� The area encompassed the original Wilbur Wright Field, the Fairfield Air Depot, and the Wright brothers� flying field at Huffman Prairie. Patterson Field specifically honored Lieutenant Frank Stuart Patterson, a son and nephew of the founders of the National Cash Register Company. Lieutenant Patterson was a test pilot who lost his life in the crash of his DH?4 aircraft during a test flight at Wilbur Wright Field on June 19, 1918. The two fields remained physically separated until after World War II, but their missions continued to be closely intertwined. 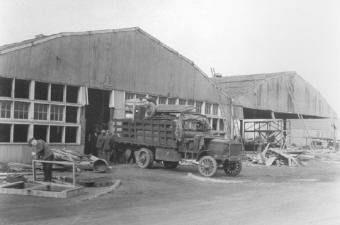 Patterson Field was a logistics center throughout the pre-war period. The Fairfield Air Depot retained its title and operated as the major organization on the installation. The depot had support responsibilities in 28 states and serviced 28 of the Air Corps� 50 stations in the United States. In 1931 it had 15 officers and 550 civilians and generated a monthly payroll of $67,000. Its headquarters moved from Building 1 (the installation�s original depot structure) to the newly completed Building 11 in 1933. 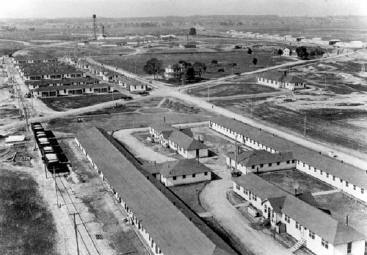 Several acres of Patterson Field were set aside in 1934 to house a Transient Camp for temporary workers employed under Depression-era programs. During 1934 and 1935, these men labored on a number of projects such as the renovation of buildings and landscaping. Young men residing in the Civilian Conservation Corps camp that was set up on the field helped landscape the installation in 1935 and 1936. The workers also contributed to the construction of Wright-Patterson�s Brick Quarters. Built in an area described as �an unsightly weed patch,� the 92 housing units were erected to house all the officers assigned to Wright and Patterson Fields. Designers arranged the $1,722,000 complex in the shape of a horseshoe with the Turtle Pond centered along its main axis and the Officers� Open Mess situated at the crown of the curve. Large, private back yards enhanced the neighborhood and created an atmosphere of informal tranquility in these junior executive style homes. The jewel of the complex was Quarters 1, since memorialized as �The Robins House� for its first occupant, Brigadier General Augustine Warner Robins. It was the residence of the installation�s senior officer. As a depot, Patterson Field supported Air Corps operations throughout the nation. It also played a key role in several operations. In 1933, it hosted the Air Corps Anti-Aircraft Exercises and the next year it modified and supported military aircraft assigned to carry the U. S. Mail. When Lieutenant Colonel Henry �Hap� Arnold (a former depot commander) initiated the long-distance Alaskan flight of 1934, Patterson Field prepared the aircraft and supported the operation. The field was also the scene of the world�s first entirely automatic landing which took place in 1937. New additions to the Patterson Field community included the Air Corps Weather School in 1937 and the first military Autogiro School in the United States. It opened in 1938. 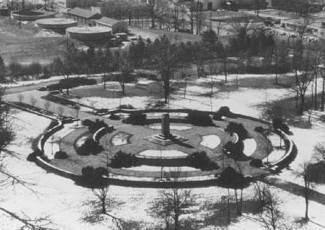 Another landmark, the Wright Memorial, was dedicated on August 19, 1940. This tribute to the Wright brothers was constructed by the Dayton community on a 27-acre site owned by the Miami Conservancy District. The Olmsted Brothers architectural firm designed the memorial which sits atop a 100-foot bluff adjacent to Wright Field overlooking the Huffman Prairie Flying Field. Funds raised by the Dayton Air Service Committee in 1924 as part of its campaign to keep the Engineering Division helped finance the monument. Six native American burial mounds are also nestled about the memorial. World War II profoundly altered both Wright and Patterson Fields. From a combined population of 3,700 in 1939, the workforce at the two fields would eventually peak at over 50,000. The workload shifted from a 40-hour week to round-the-clock operations. The faces of the two installations also changed rapidly as massive construction programs erected new work centers and housing complexes to accommodate wartime operations. Existing facilities were modified and converted to new uses. Numerous laboratory structures joined the Wright Field complex. Among these were the vertical wind tunnel (Building 27) for parachute testing and the 20-foot wind tunnel (the world�s largest). The huge Static Test Facility (Building 65) was constructed to test the B?36 bomber. Engineers designed and built an acoustical shell around the propeller test rigs (Building 20A) so the constant droning would not disturb the sleep of base personnel and the civilian community. Wright Field expanded in size as well when the Hilltop area along National Road was acquired. This land area became home to the Wright Field headquarters (Building 125), a parade field, a barracks complex, and quarters for the prisoners of war who were interned at the field. Work at Wright Field centered on research, development, and procurement, with emphasis on the latter. The race to increase propulsion power and efficiency was the field�s most significant R&D effort of the war. These efforts, for example, eventually enabled heavy bombers to exceed 30,000 feet and the B-29 to approach an altitude of 40,000 feet. The field�s engineers and scientists conceived and put into production the airplanes responsible for Allied victories. Victory brought great celebration. It also gave Wright Field an opportunity to educate the public on its achievements and the revolution in aviation technology that World War II had spawned. Wright Field hosted a two-day Army Air Forces Fair in October 1945 that attracted 500,000 people. The fair was so popular that base officials extended it for a week. More than one million people from 26 foreign countries observed displays of Army Air Forces operational and experimental aircraft. The highlights of the event were exhibits of captured German and Japanese aircraft, rockets, and equipment. In all, over $150 million worth of equipment, much of it previously classified, was put on display. Victory also brought demobilization and a return to �normal� operations. Procurement moved to the back seat as the operational emphasis at Wright Field returned to research and development, although the focus of the work shifted from propeller-driven aircraft to jet propulsion. Wright Field also moved away from developing, modifying, and improving individual items in favor of a coordinated approach that emphasized new systems and models. In late 1945 the Air Documents Research Center moved to Wright Field from London. Working under T?2 Intelligence, a team of almost 500 people catalogued, abstracted, indexed, and organized 55,000 captured German documents representing the cream of Germany�s aeronautical research and development. German aircraft and engines were also shipped to Wright Field for analysis. Finally, Projects Overcast and Paperclip brought prominent German scientists to the field where they contributed their knowledge to the future of American aeronautical engineering. When the war ended, Patterson Field hosted an Army Air Forces Base Unit Separation Center that processed over 35,000 soldiers from the service. Peace also dramatically reduced the depot�s supply and maintenance operations. In January 1946, depot operations formally ended at Patterson Field when the Fairfield Air Depot was officially inactivated and its functions transferred to Air Materiel Areas. Wright-Patterson Air Force Base became a unified installation just as the Cold War began to heat up. The Berlin Airlift, Korean War, and other Cold War activities directly impacted its operations. The Berlin Blockade and Airlift began in June 1948 and lasted until September 1949. The installation�s manpower soon rose from a postwar low of 21,000 in 1947 to 25,000 in 1949. During this time, the aircraft logistics support that made the airlift possible was directed by Headquarters Air Materiel Command in Building 262. AMC managed the transfer of the larger and faster C?54 transports to Germany and maintained a pipeline of parts and supplies that kept the aircraft flying. It also arranged for contract maintenance to handle the overwhelming workload created by the operation. When the Korean War broke out, Wright-Patterson�s workload and labor force rapidly expanded to meet wartime demands. Automation and decentralization became major trends at Air Materiel Command. The rapid acceleration and expansion of aerospace technology led to new, specialized research centers throughout the country. Through the course of the 1950s, Wright-Patterson transferred its large engine testing and ballistic missile development to these centers as well as its electronic support systems, armament, and rocket engine work. New tenant organizations added to the flightline activity. The F-86Ds and F-104 Starfighters belonging to Air Defense Command�s 97th Fighter-Interceptor Squadron (later redesignated the 56th FIS) provided air defense for the industrial areas of the Miami Valley from 1951 to 1960. The 58th Air Division also operated an air defense control center for an eleven state area from 1955 to 1958. The Soviet Union launch of the Sputnik space satellite made the Strategic Air Command aware that a missile that put an satellite into orbit could also deliver a nuclear bomb to its bases. B-52 bases had three squadrons of 15 planes each. Each was converted into a strategic wing and dispersed to separate bases. Wright Patterson AFB acquired 465 acres on the northeast corner of the installation where it built the West Ramp complex to house the SAC wing and its B-52 bombers and KC-135 tankers. The 42nd Bomb Squadron of from the 11th Bomb Wing became the 4043rd Strategic Wing. 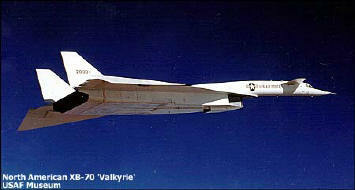 It began operations at Wright Patterson AFB on April 1, 1959, where it maintained six aircraft on ready alert. It was also assigned the 922nd Air Refueling Squadron. The 17th Bombardment (tactical) flew B-26s during the Korean War. When it returned to the states in 1955, it began flying B-66s. It was inactivated June 25, 1958. Redesignated the 17th Bombardment Wing, Heavy, it was activated at Wright-Patterson on November 15, 1962 and replaced the 4043rd Strategic Wing in February, 1963. It absorbed the 42nd Bomb Squadron and 922nd Air Refueling Squadron. It trained to maintain proficiency in strategic bombing and aerial refueling on a global basis. It furnished B-52s KC-135 aircraft and crews to SAC units in Vietnam from 1966 to 1975. The 17th Bombardment Wing transferred to Beale AFB, California, in 1975 thereby ending the strategic nuclear alert mission at Wright-Patterson. The Air Force opened the decade of the 1960�s with a major restructuring that would govern operations at Wright-Patterson AFB for the next thirty years. On April 1, 1961, the Air Force transferred Air Materiel Command�s procurement and production functions for new systems to the ARDC. It then redesignated AMC as the Air Force Logistics Command (AFLC) and ARDC as the Air Force Systems Command (AFSC). Routine business at Wright-Patterson soon gave way to the growing requirements of the nation�s military operations in Vietnam. Headquarters AFLC�s requirements for supporting the forces and bases in the theater of war grew rapidly. By September 1964, AFLC was calling upon the 2750th Air Base Wing for assistance. The wing immediately began shipping materiel and providing support personnel to the combat theater. It quickly became a prime procurer of loaders, revetments, and shelters. In November 1965, the wing provided fifteen members for AFLC�s first Air Force Prime BEEF (Base Engineering Emergency Force) mobility military civil engineering force. Other base support over the years included flight training, small-arms weapons training, vehicle operator training, and laundry management courses. On the Wright Field side of the installation, the research laboratories and the Aeronautical Systems Division were busy inventing and improving the systems used by warfighters. The laboratories were developing jet fuels and lubricants for all services, working on phased array radar and airborne lasers, exploring the use of composite materials in structures, and pursuing stealth technology and fly-by-wire technology. Wright-Patterson AFB in 1960 had 100 tenants representing 150 organizational units and boasted fixed capital assets of over $208 million on base and $6 million off base. As in previous conflicts, the base population jumped, this time from 25,000 to over 30,000 by 1964. It then declined before stabilizing between 25,000-26,000 for the duration of the war. Meanwhile, consolidation and automation continued as trends in base support operations. The end of the Vietnam War brought with it a period of rapid transition and uncertainty within the defense establishment. Mmany activities at Wright-Patterson AFB converted from government to contract operations. Organizational changes occurred as the Air Force moved away from its Vietnam-era structure toward one better suited to the Cold War and the dynamic progress of technology. Base flying operations in the post-Vietnam era underwent dramatic changes. In 1975, the Air Force decided to retire much of its aging fleet of administrative support aircraft and reorganize the rest. The 2750th Air Base Wing transferred most of its aircraft to the Military Aircraft Storage and Disposal Center in Arizona. The wave of historical interest spawned in the 1970s was joined in the 1980s by an active concern with environmental management. At Wright-Patterson, the environmental protection initiatives included an investment of $37 million to modify and modernize the base�s coal-fired heating plants. The base installed new boilers and electrostatic precipitators to meet federal and state environmental regulations and shut down three of its five heating plants. Environmental managers also started surveying potentially contaminated sites and developing remedial action plans to clean them up. 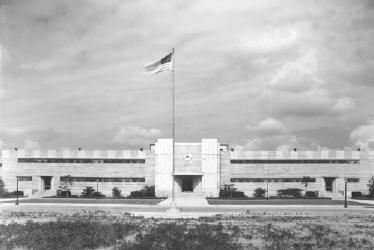 The World War II appearance of Wright-Patterson AFB continued to fade as old facilities were either torn down or modernized and new ones erected. Tenant units continued to arrive and depart the installation. Largest aircraft museum in the world. Over 300 aircraft and missile on display.